We were invited to a 5th safe party this year! That’s a record, friends! We are always humbled, grateful, excited and a bit nervous when we go to parties. The anti-histamine the allergist has SG on has helped tamp down her constant contact reactions tremendously, but it still occasionally happens. So, my sweet cousin N invited us to her daughter’s party and offered to have only safe foods. I offered to make the cake. N requested a Shopkins Kooky Cookie cookie cake. The Huzz and I are always up for a good cake challenge, and we tackled this one the way we do best- together. I baked the cookie cakes and he did all the decorating with the frosting. Good ‘ole Pillsbury frosting. We surprised N with an extra cookie cake- Cheeky Chocolate. As I shaped Kooky Cake with the raw dough, I realized I had enough dough left for an extra cookie cake. I showed the Huzz several images and he picked Cheeky Chocolate as one he thought he could well. The baking of the cookie cakes was my part. I simply use this food allergy friendly chocolate chip cookie recipe from Silk. Click here for the recipe. I take about half of the dough per cookie cake and shape it with my hands until the desired shape is reached. For Kooky Cake, I shaped it into a circle as big as my round pizza pan. We put parchment paper on the pan and shape the dough on top. For Cheeky Chocolate, I formed a tall rectangle. I baked the cookie cakes on 350 on convection for 13 minutes. We let the round cake cool almost completely before the Huzz cut out the bite marks in Kooky Cake. Then we let the cookie cakes cool completely before the Huzz decorated the cookie cakes. We used these Pillsbury frostings: 1.5 cans of chocolate fudge, 1 can of cream cheese (it’s dairy free! ), one can of vanilla hot pink frosting and one can of vanilla neon blue frosting. And my frosting tool that helped me create SG’s beautiful Barbie cake last year. The cookie cakes were a hit, my daughter had a blast and there was not a single piece of cake or frosting left. I’d say that was a successful party! Thank you N for having a safe party when you didn’t have to… you’re pretty rad! (Did I just date myself by using rad?) Haha! Happy cookie cake baking, my friends! I have begun to experiment with tofu. I don’t know why it took me so long to research safe tofu companies. I got in touch with Nasoya and was told their facility is free of dairy, eggs and beef. SCORE! Let the tofu love begin! I have made tofu at home three times in a little over a week. I have made a tofu and veggie stir fry twice. Yum! Last night, I decided to try an old chicken recipe with the tofu. This recipe comes from allrecipes.com. I have modified the spices a bit. Feel free to change the spices to ones you and your family enjoy. I also use homemade bread crumbs, but store bought breadcrumbs or panko would work well, too. This breadcrumb mixture made more than enough for half a container of tofu. I think I could have used this recipe for the entire package, but I was hesitant to use all the tofu in case this didn’t turn out. But it did and my little family loved it! So tonight, we are having the other half of the tofu and I’m making these crispy shake and bake tofu tenders again! Along with some garlic mashed potatoes and maybe some stewed fresh green beans. And some homemade vegan gravy for the taters and beans… Mmmm, mmm! I better hurry this post up so I can cook- it’s almost dinner time already! Prepare your flax eggs in a medium sized bowl and whisk with a fork. When the flax eggs are gelled and gooey, they are ready. Take everything above the starred line and mix it together in a gallon plastic baggie- adding the oil last. I like to shake the dry ingredients together first and then add the oil. Bake for 5 minutes. Gently flip the tenders. Bake for 5 more minutes. Flip tenders. Bake for another 3-4 minutes, or until tenders are crispy. It totally looks like chicken- but it doesn’t taste like it. The flavor is all in the crispy coating, so don’t be afraid to spice it up in the bag! Coco Whip & Pudding Mix: Dairy Free Parfaits! It’s like dairy filled whipped topping, but better. Thank you SO Delicious for making this AMAZING and SAFE food! Our local grocery store just got it in and man, oh man… all three of us LOVE IT! I’m using lots of caps y’all, because we are so thrilled! A whole new world of recipes have opened up to us. I’ve been all over Pinterest looking for new recipes to adapt. 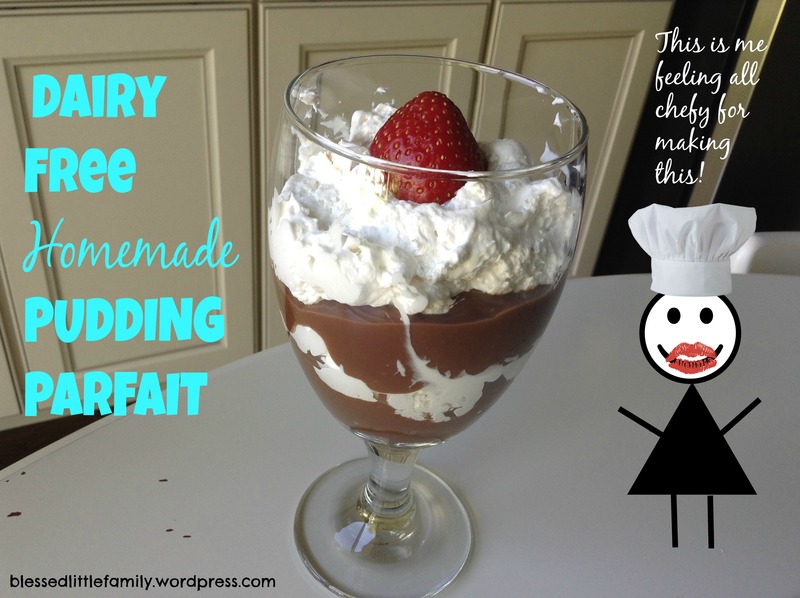 Some of the recipes I found require pre-made pudding mixes. If I can make it homemade, I would rather do that. Cheaper. Safer. ‘Nuff said. I tried the one recipe that seemed right. I feel like I kind of have a spider sense when it comes to picking the best Pinterest option when I’ve pinned multiple different recipes. And my Spidey sense was dead on, y’all. This chocolate pudding is good! Make a batch of Silk’s chocolate pudding. Lately, I’m really big into making homemade mixes, putting them in a cute container and slapping on a reusable chalkboard sticker. I have a chalkboard pen that I use to write on my labels. I’m slightly obsessed, y’all! My point in all this is to simplify life. I get in the mood to make stuff and go for it. 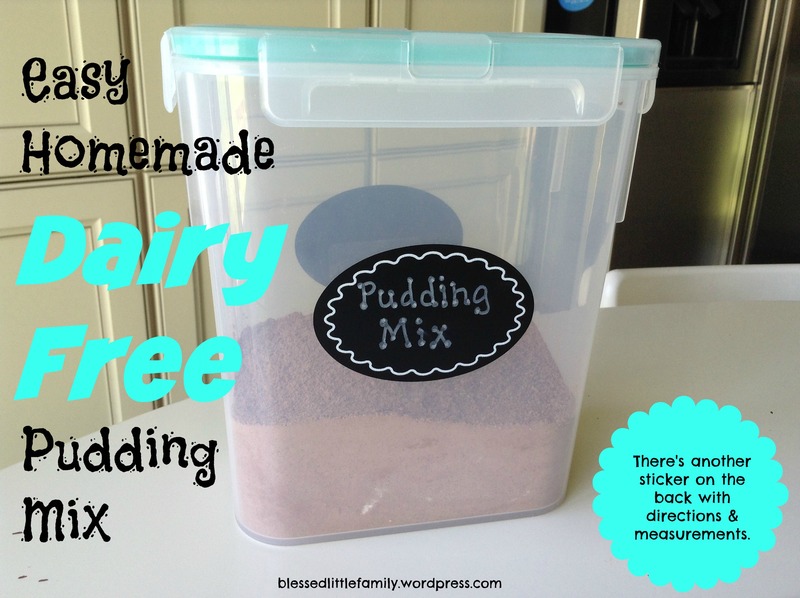 It’s nice to have a homemade brownie mix or pudding mix ready to go. And it makes me happy to see it in a cute jar. Here’s some pics of some of my homemade mixes. 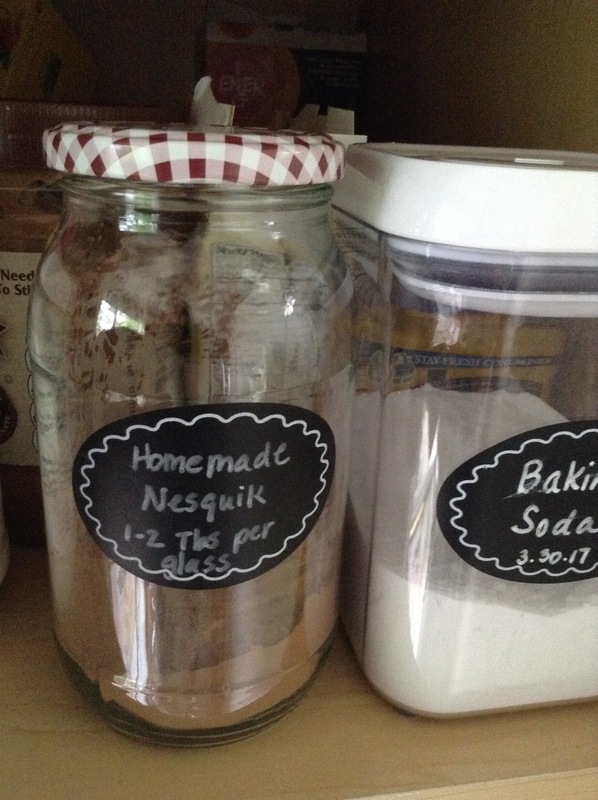 Homemade Nesquik. This would make a great hot cocoa. It’s hard to mix with cold milk, but very yummy. The stickers and chalkboard pen are from Hobby Lobby. 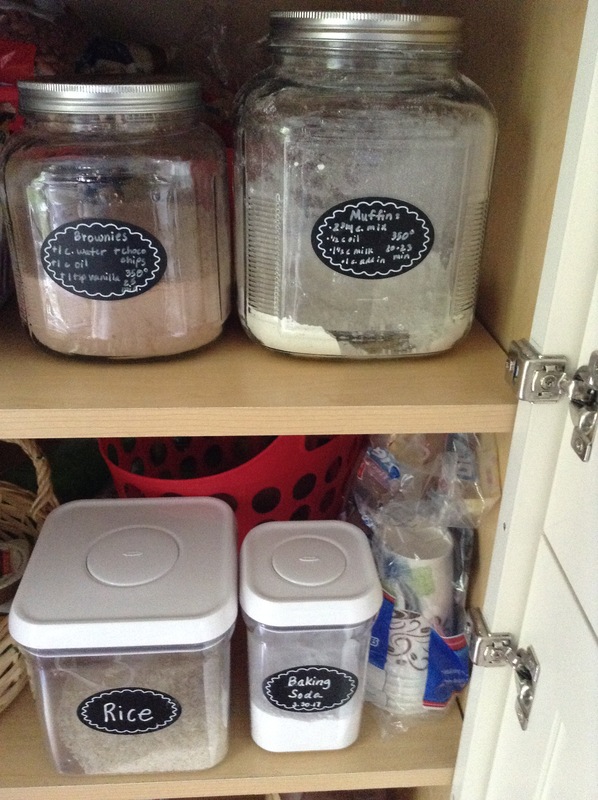 The glass jars and the glass jar with a red lid are from Target. The plastic containers are from TJ Maxx. But I digress… back to the pudding parfaits. I made the pudding I mentioned above and let it cool in the fridge for several hours. Then I layered the chocolate pudding and the coco whip in a pretty glass. I topped it with a strawberry. I tried my hardest to make the layers pretty, y’all, but it was so messy. And the batteries on my good camera are dead, so these are all iPad photos. Oh well. It works. The Huzz and I loved the parfaits. SG only liked the Coco Whip, not the pudding. But she’s only ever had pudding once before. She’ll get used to the taste and texture. The Huzz polished her parfait off. The verdict? Delish! And we will definitely make this again.